The Steel Natural Balance® Shoe is a wide-web, rolled toe shoe which offers maximum support to the hoof. The toe area on the foot side is seated out to eliminate sole contact beneath the tip of P-3. The toe portion also has greater mass which means more material for wear. The rim-shoe design helps to improve traction and will still allow the toe to wear back some as the foot grows longer. 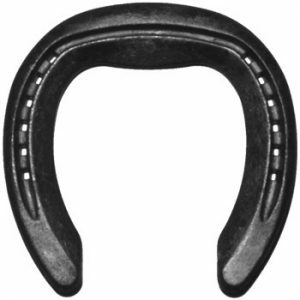 This will help maintain optimal P-3 and hoof wall orientation through a longer shoeing period. The roll at the toe continues around the toe quarters, back to the widest part of the shoe and allows the horse easy access to his individual position for breakover.